When you are having a Thesis wordpress theme (by DIYthemes), is it possible to combine with a page builder? You may want to use a pagebuilder to build more professional looking sites without the need to know any coding. And if yes, what is the best page builder that is compatible with Thesis theme? First, it is possible to integrate a pagebuilder plugin if you are using Thesis wordpress theme? At first, I had thought it was not possible. Through a number of YouTube reviews, I initially bought the Divi theme. But I find the concept of Divi theme not suited to the objectives that I have for my sites. Hence, I canceled the purchase and was prompted refunded by Elegant themes as the cancellation was done within 30 days of purchase. True to their word, they really refund promptly. If you would like to have the type of effect of a drag and drop for some pages but not for the whole site, a page builder I strongly recommend is Elementor plugin. So far I did not encounter any conflict using the Elementor plugin together with my Thesis theme. The best part is, the plugin is FREE… however if you wish to have premium features, you would need to pay for it. 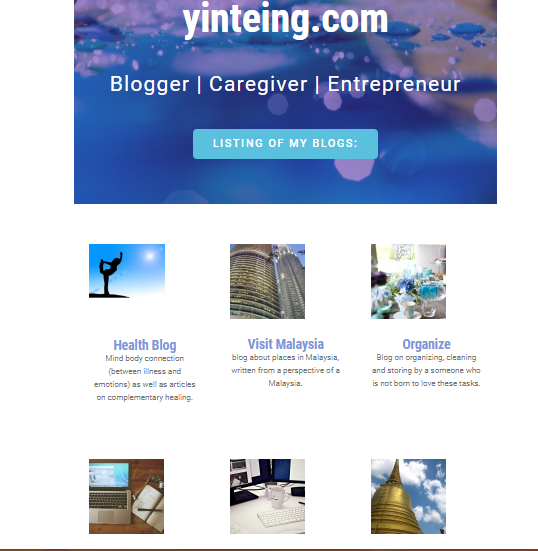 The above page, www.yinteing.com is constructed using drag and drop page builder found in Elementor. It is seriously lots of work to redo all the customized pages and sidebars that I have build using Thesis skin editor. Somehow I feel the structure of Thesis is very stable, that my pages are still intact even if there are updates or changes. For example, let’s say I change to a different theme…. all I lose are my customizations (sidebars and page template) but my content would still be intact and would be displayed using default sidebars and page. Whereas if I were to change theme for page builders, I may end up having my pages filled with shortcodes or my alignment being all over the place. I build my sites around a lot of information and writing. It’s words, words and words. I find the structure of Thesis theme makes it easier for visitors to search for information. On mobile and AMP, most sites look the same and the visitors are more interested in obtaining information they required rather than admiring the aesthetics of the site. Having said that, I still wanted my homepage and a couple of landing pages to look more sophisticated. In those pages, I would use the Elementor plugin to build the pages. It’s quite fun and you can let your creativity run while. But again, it would be something that I would not convert the entire contents of my site using drag and drop function as it is too risky. Do take note though, that the free version of Elementor plugin does not have the Global service. This means if you have designed your homepage banner for your homepage, you cannot copy over the banner to another page like your “About” page. If you wish to replicate certain blocks or design at multiple pages, you would need to pay for their pro version which is USD$49 for one site, USD$99 for 3 sites and USD$199 for unlimited sites. Bear in mind the price is per year– meaning one year’s support and updates. After a year, if you do not renew, you need not worry. The pro features would not be taken away…. basically whatever pro features you have used would still stay there. Just that you cannot make use of the subsequent pro features if you did not pay for renewal.